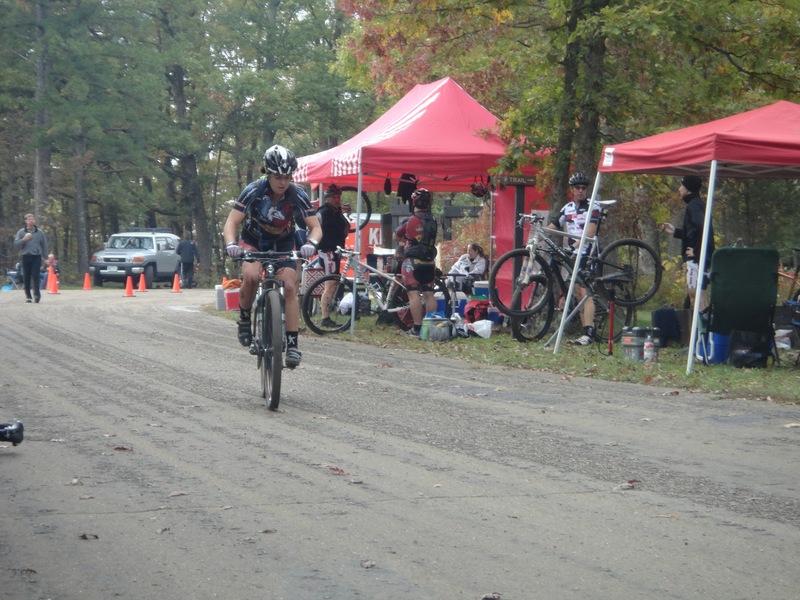 Burnin at the Bluff: the mountain bike race for everyone who's anyone in the greater St. Louis area. 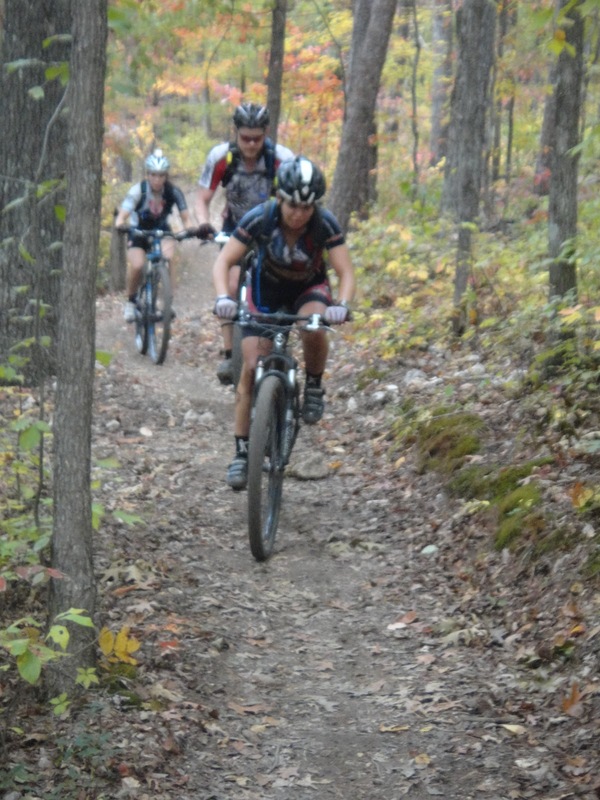 Relay teams and solo racers compete for who can complete the most laps around Council Bluff Lake, a 13-mile loop of fun singletrack. I drive down to CBL solo, jamming out my standard pre-race playlist with some added tracks from Mumford & Sons and Trampled by Turtles (yeah MK!). The drive down to Potosi has turned into one of my favorites and this weekend the trees are approaching peak colors...it's beautiful. I roll into the campgound a little before sunset and find the Pfoodman compound...it's not hard when we have 4 campsites, about 10 people tents, 2 food tents, and...get this...a movie tent from our sponsor Polk Audio. Talladega Nights is playing as we make/eat dinner; I only have a little since I've brought my standard pre-race pizza (bbq chicken, yum) that I made at home. What? 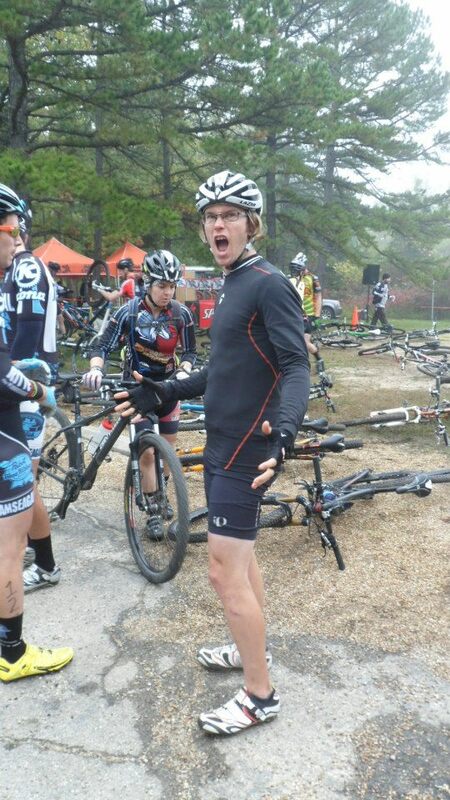 Peat wearing spandex? (and me in the background pre-race) Photo by Karen Holtmann. Of course while we're eating, the conversation turns to the race ahead of us tomorrow. My teammate Sally and I are both signed up for the 6hr solo category, along with a few other women. But, there is only 1 other woman doing the 12hr solo race, Wendy Davis aka Sasha Petrosevich who has won this race twice before. 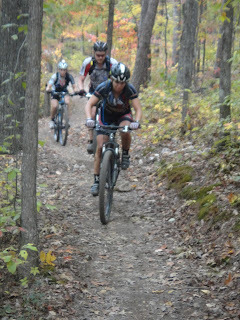 While I was night-riding with GearJunkie/WEDALI at the Berryman 24hr AR (note: new pics added! 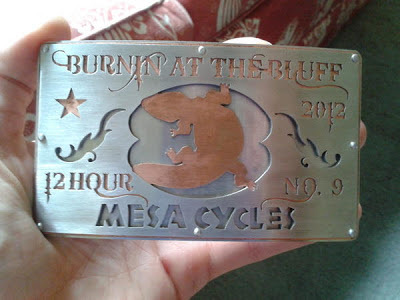 ), I really enjoyed the section we had on the CBL trail and it planted a seed in my head about doing the 12hr at Burnin, but since then nothing grew out of that seed. Now at dinner I'm getting comments from the peanut gallery that I should "woman up" and give Wendy some competition. I hem and haw and after doing some calorie calculations, I agree that I'll race the 12hr in the morning. Nothing like doubling up your race distance the night before! Race morning is damp and misty. It takes The Claw and I several attempts to get the gas burner started so we can have our precious coffee...we finally take a coal from the fire, light a paper towel wick, and then use that to light the propane. Pancakes are on the menu but I brought my own (again, standard pre-race) oatmeal so I'm able to chow down immediately. I make a couple of extra turkey sandwiches to fill my race calorie deficit and then haul everything down to Race HQ to set up the pit. The minutes fly by as they always do and pretty soon Sally and I are laying out our bikes for the LeMans start. Mesa sets off their signature smoke bombs and then it's time to race! I have absolutely no desire to get caught in the chaos of the speedsters and team category racers so I casually jog to my bike and start riding. Almost immediately, I spot Wendy's Team Seagal kit and we ride side-by-side down the campground road. She gives me some advice on the 12hr race, namely "it's a long day and you only do one thing...ride your bike". We with in a conga line for the first 1-2 miles and it's easy to cruise. I'm riding just behind Wendy and it's a spot I'm happy to stay in - I can watch her lines, watch which sections she walks, and get a feel for her pace. We stay largely together except I have some minor gear issues - my saddlebag won't stay snug and my water bottle cage rattles loose (ejecting the CarboRocket bottle I was carrying, boo). I also get to ride a bit with Cory on her first ever Burnin lap, which is cool because she is the one who sold me my mountain bike! I keep the pace just super chill and easy, and my mental jukebox cues up Burn One Down. Late in the lap, I choose to ride a section that Wendy walks so I take the lead heading back up to the campgound. On that campground climb, I catch sight of Sally and we chat a bit, she's having a rough start to the 6hr race with some cramping issues. She paces me up the hill (a wicked way to finish each lap) and we roll into race HQ together. Our Pfoodman teammates are there to help us each have a quick pit - James removes my broken bottle cage while Matt helps Sally refuel. We're out in a flash and on to Lap Dos. I lead out of the campground but get stuck in a tricky switchback that Sally rides clean. But just like in the first lap, I'm happy to have a trusty wheel to follow. Sally and I ride a few miles before leg cramps bring her to a crushing, painful halt. I can't do much besides offer encouragement, which I do before continuing onward. I'm sad to leave my riding buddy behind, except I think I hear Wendy shouting encouragement too so that means my gap is minimal at best. Burn One Down is still playing in my head and I'm super happy to be riding my bike. That is, until I lose control on a tricky, rooty downhill and fly over the handebars. But I'm pretty lucky that this downhill is only dirt and gravel and not rocky like a lot of the trail, and escape with merely flesh wounds on my knee and elbow. A few miles after the crash, I spot my dropped bottle from Lap 1 and eagerly pick it up - the CarboRocket tastes delicious and I'm happy to be back on track with fueling after falling a little behind in the first lap. The rest of the lap goes well and pretty soon I'm grunting up the campground climb. Again, my Pfoodman teammates are ready at the pit but I only need to switch bottles. They tell me that my Lap 1 gap to Wendy was only a few minutes and they don't have a split for me since then. This scares me a little so I hustle out to start Lap Tres. Rolling out on Lap 3. Photo by Carrie. Now I feel like the race has started. I don't remember much about this lap except my mental jukebox switched to Best Of What's Around and I ran into a tree. When I roll through race HQ at the end of Lap 3, the Pfoodman boys tell me my gap is more like 15-20 minutes which makes me feel way better. Struckman reminds me to keep riding steady, which is ironic because that's the mantra embraced by GearJunkie/WEDALI (side note: while I was riding, they were racing USARA Nationals and they won!! so happy!! 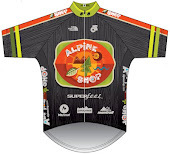 also congrats to Bushwhacker and Alpine Shop for your excellent finishes!). Up the campground climb in Lap 4. Photo by Carrie. Throughout the previous 3 laps, I had been doing a decent job with the positive self-talk, but Matt's reminder heading out onto lap 4 really kicks it into over-drive. One thing that's helped me in recent adventure races is a really positive team vibe, complete with frequent words of encouragement and inspiration. Here, I have no teammates to rely on, so I start a my own near-constant stream of out-loud coaching. It would be pretty funny to carry a recorder and listen to some of the stuff I said, but mostly I'm channeling this guy and this guy. I add in lots of "good girl", "nice line EK", and "good job buddy". Even with the barrage of positive self-talk, I am not in an ideal place physically. My left groin starts to cramp (cramping of any kind is unusual for me) and when I try to increase my fluid intake, I find that my bottle and CamelBak are almost dry. Crap! My mental jukebox slips into Gave You All, and I just focus on staying as positive as possible and grinding out the lap. I walk often. I give myself the luxury of riding both the doubletrack/red and campground climbs in my granny gear. Coming back into Race HQ, I know it's time for a nutritional intervention, and thankfully James and Matt are ready to help. Matt fills my 2L bladder with water + 4 nuun tabs. James opens up a Cokette for me to drink now and puts another one in my bento box. I swap bottles, learn my gap is has increased to 20-30 minutes, and cruise out of the pit. Fueled by delicious Coke, I can already feel my spirits improving on this lap and the positive self-talk reaches a new level of extravagance. I'm complimenting myself out loud on any tiny thing that I do right and drinking nuun and CarboRocket furiously in an effort to keep cramping at bay. A couple of miles in, my mental state does a complete turn around and I am jamming. Not going fast by any stretch of the imagination, but back to enjoying mountain biking and this beautiful day. Strangely, my mental playlist switches tothe potentially-annoying This Is The Song That Doesn't End but I change the lyrics to be about riding bikes and sing out loud. My feet and fingers are hurting quite a bit and sometimes I have to growl at the trail to distract myself from the discomfort. I know for sure a couple of racers/spectators heard me when I didn't realize they were there, but that's what happens in endurance racing...people get real! I am back in my happy chain ring, the middle one, and legs are feeling pretty good, considering. I muscle up the campground climb, preparing myself for the zen of night riding that will happen on my next lap. Except, when I cross the line, the timers (Struckman and Claw) tell me that I don't have to go out again - Wendy stopped at 4 laps so my 5 laps are enough to take the win after only 9 hours of riding. I can't really believe it. 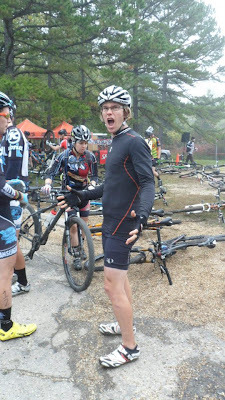 I'm so hyped up on sugar and caffeine that I consider taking a Specialized demo bike out on a sixth lap. But with BTEpic just a two weeks away, I know the better decision is to stop riding...and start drinking! So I finish the day with 65 miles of mostly singletrack, my longest mtb ride ever, in a chill 9 hours and 4 minutes. And no flats. Did I mention Burnin is a party first and a bike race second? I take my sweet time cleaning up and eating dinner and then head back down to Race HQ, armed with a bottle of WTAH. It's not hard to find people to share, and with the Mesa folks serving up some deliciously cold PBR, pretty soon we've got a legit party. 12hr solo men and teams are still racing, and it's inspiring seeing my friends (Mary and Keri I'm looking at you!!) put up some awesome night lap times. I find Wendy and we have a quality chat about the race - I am glad she isn't mad about me switching categories last-minute, and now we are both glad to have the opportunity to hang out instead of riding more laps. Speaking of hanging out, the Burnin after party is only an extension of the mad mtb love that was happening on the trail all day. I got so much encouragement from the riders passing me. I had no idea that many people would call me out by name, giving me a little mental boost each time. I'm sorry that I didn't always return the favor since it's hard to recognize people when they're passing by very quickly! But the STL mtb community is one of the best around, very similar to the midwestern AR community in that we are all pulling for each other to have great days on the trail, to crush our own expectations, to go GETCHASUM!! Jerks. 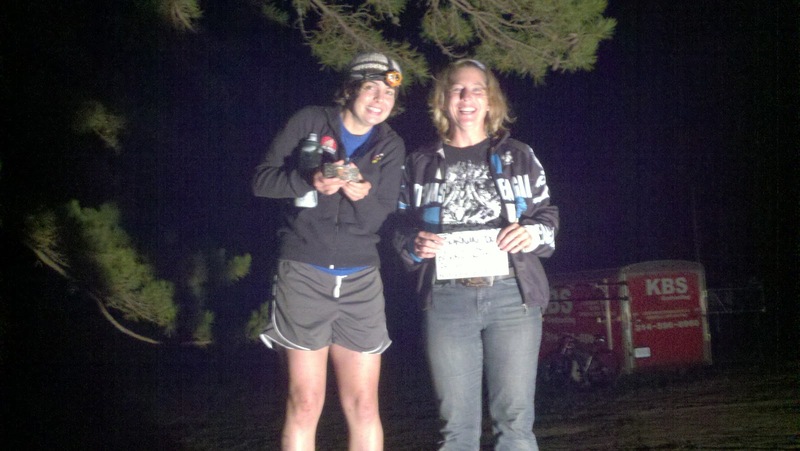 Women's 12hr solo podium! Me and Wendy. Notice my tightly clutched WATER bottle. Photo by Claw. You crazy girl...doubling up your race at the last minute! So awesome! You've had a heck of a year in racing. Look out, BT Epic!